Obviously it is no secret that I enjoy traveling. I definitely got the wanderlust bug from my father’s genes. And what about the summer and beyond? I don’t have any travel plans right now but there is a slight chance I might use up my Chinese visa before it expires (and I have to try and get one of those new 10-year visas) which means I would head over there before the middle of August. I also have this desire to visit Europe in the fall. Maybe Italy and some of the countries I haven’t been to yet. It is just a thought in the back of my head right now so nothing is actually decided. Create an outline in evernote for travel, transportation, lodging, events and contacts during each day of the trip. This usually takes me just a few minutes to do. Then, as new details of the trip become available, you put them on the note on the day they are applicable. For example, if you get your flight reservation, then put all that information on the Evernote under “travel” for the date of the flight. As you get closer to the date you can start to see the parts of your trip that still need to be filled in. Did you forget to get a place to stay on the 3rd day? Do you know how to get the bus from Point A to Point B? Think of it like a puzzle that you have to find all the pieces for. It’s actually kind of fun (or maybe it’s just fun for me?). Before traveling, be sure you have saved the Evernote on your smart phone or tablet in “offline” mode, so that you can access it without being connected to the internet. 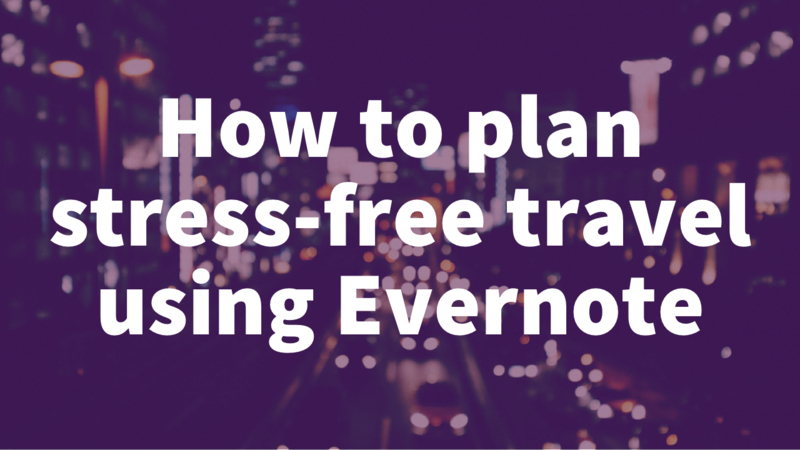 During the trip, review the Evernote each evening before you go to bed. Move the just-ending day to the bottom of the document under “Travel Log” and then make sure you have all the information you need for the next day. Thanks to this system I almost never am at a loss for information when I’m traveling and always know where I’m supposed to go. The best thing about this is that it takes all the information out of your head so that you can spend more time focusing on enjoying the process of visiting wherever you are. After all, isn’t that the whole point of traveling? Why spend the whole time stressed out about how you’re getting around or where you’re staying? With this system, the only things I really need to travel with are my smart phone, my passport and my wallet. With just those three things I can pretty much do my entire trip. No more big folders of documents or printouts of reservation information. It’s all just a finger swipe away. Let me know if you have any questions about this system. I probably glossed over some detail that you want to know more about so just ask in the comments below and I’ll be happy to provide more information.